Those new to MEPIS or not very experienced can post their questions here. Thanks to the forum, I got that fixed and now it seems to work ok.
sudo apt-get update .. Works. raise NoDistroTemplateException("Error: could not find a "
Tried a couple other PPAs and keep getting the same errors. Hmmm .. What has happened to my .. /etc/apt/sources.list? Synaptic Package Manager .. Wants (Keyring) root password to run. Anyway .. My setup ..
Not a real good idea adding ubuntu ppa's to Debain and Mepis. They are not Ubuntu. But it is your computer. So if you wreck your install. Just remember, somebody warned against this. No, it probably isn't a good idea. I had been using ClearWeather from Screenlets, but it stopped working. Still on my desktop. I see from the (older) manual section that Sources.list is handled differently now. Like 4 files and so on. I'm not sure if something is broken or not? Anyway, conky is setup and running, (emays) but maybe I could add a 2nd conky and the weather app. I added Noobslab PPA for Ubuntu with no issues, but I used it only to try different icon themes. added @antiX and @antiXhome subvolumes and copied antix 13.1 base into them, adjusting Grub from MX-14. it working. I did that and it still doesn't work. It reports it can't connect to weather.com. WOEID codes -- http://isithackday.com/geoplanet-explorer/index.php? Still it doesn't work. Code for (east) St.John, NB, Canada is .. 1533. The code by weather.com is CAXX9925:1:CA. in the manual on the site here, I don't know. Last edited by KernSpy on Tue Sep 22, 2015 8:33 pm, edited 1 time in total. Well, I just got the commands from Crunchbang forum, I need to find it again. But they work if you need to add a repository for which you don't have the public key on your system preinstalled or as a package like debian-archive-keyring. A public key (actually a digest of it, a public key is much longer) is published on the website of a repository. You need it to verfy that a package you (actually your apt-get) download is from this repo and not from a malicious source. After you added a repo you copy the public key from its webpage and issue the command I wrote above. This commands ask a keyserver (you can use other keyservers like pgp.mit.edu) to send you the public key matching the digest you pasted. The last command afaik signs the key with your private key so your system knows it is trustworthy. For background info, look for GPG in Arch, Debian or other Wiki of your choice. It actually is a complicated matter. I didn't unsderstand it for quite a long time when I started reading about cryprography. And I actually don't know whether you need it at this point. Maybe I didn't read your post carefully enough. The checkaptgpg command/script will fix most GPG NO_PUBKEY errors, as long as the key has been uploaded to one or more of the keyservers. Yeah, MX stays much closer to the Debian way of doing things, with an actual root account, than Ubuntu. It's normal. You takes your chances with a PPA--some may work and some may not. Adding Ubuntu or upstream Debian repositories in a misguided attempt to get a PPA package to work is almost guaranteed to break your system--maybe not immediately, but often it will be "poisoned" and then start dying in mysterious ways. Check out our community repositories for the right way to add new or upgraded packages. 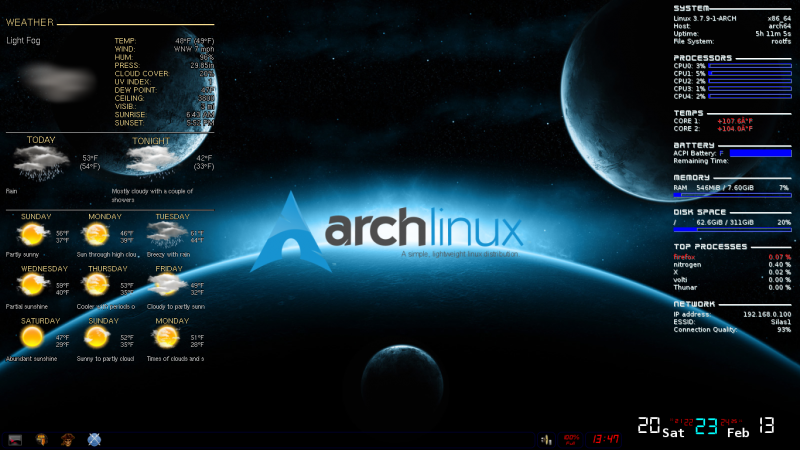 We have conky-manager and conky-manager2 which have access to many customized conky setups. I'll see if we can port over that PPA package. Thanks for info and source. Guess I should bone up on all the gpg, keys, security / cryprography stuff. Take care and best wishes! OK Good .. Glad my system isn't messed up! OK, well I don't need that. My MX-14 is working really good and hopefully I can keep it that way. add conky manager2 and mess with that. (porting over that ppa) That would be great Stevo .. Thank You! A friend of mine lost his XP os due to a serious virus. He doesn't have an XP disk, so he has Linux installed now. His HP laptop starts up and gets a black screen. He restarts and Linux loads fine the second time (boot) around. This happens every time he starts up his computer. Think I'll see if he will let me clean it off and install MX-14 on it. Right now he is running Linux Lite 2.6.